The people of Mycenae were Indo-Europeans who came to Greece between the 20th and 16th centuries BC. They spoke a language similar to what the future Greek dialect would be. The civilization flourished from the 16th century to about the end of the 13th century BC. The Mycenaeans were also successful traders and controlled trade routes to the Corinthian Isthmus. The Mycenaean’s built palaces and fortified citadels. 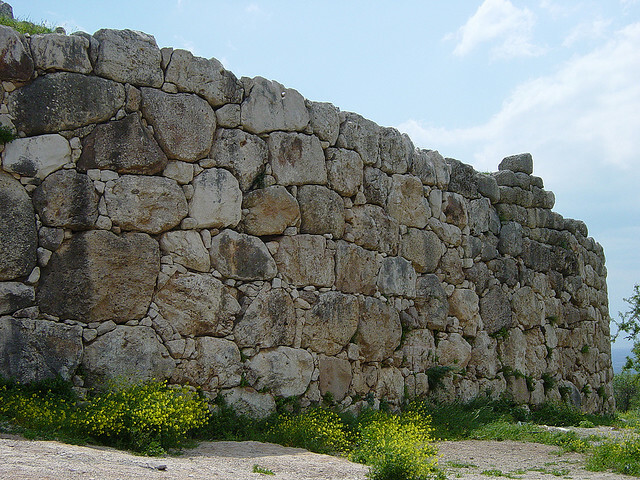 The citadel walls were built out of large stones, which are referred to as the cyclopean walls. Ancient Greeks believed the only way they could have been built was by cyclops, which is how the walls received their name. These kinds of walls were very common among other Mycenaean citadels as well. At the back of the citadel there is a secret stairway that has ninety-nine steps leading down to a large container. This was connected to a spring by pipes in case in times of war everyone was trapped inside the city. At the highest peaks of the citadels, the king’s palaces were built. The planning of the palaces was similar to Minoan structures.The palace that was discovered at Mycenae matched the description of where Agamemnon lived, as described by the Greek poet Homer. This further added to ideas that Agamemnon was a real person and not just a king of myth. The citadels were also administrative headquarters for the rulers. The common people of the town lived at the foot of the citadels in the countryside. Experts can tell the difference in the society structure by the goods buried in the graves. This shows that there was definitely a lower class and ruling class. The political hierarchy consists of the king on top, who was the political and religious leader of the town. Underneath the king were the local chiefs who looked over administrative duties. The safety of the town was left up to the Lawagetas, the head of the army. Scribes overlooked economic production and transaction, allotted work and distributed rations. In Mycenaean economy there were two types of people: the ones who worked in the palace and the ones who were self-employed. Even the workers in the palace could be self-employed if they wished though. The Mycenaens were a warrior culture as well as great engineers who built bridges, tombs, and palaces. They also invented their own script called linear B which was an improved version of Linear A or the Minoan language. From clay tablets we can tell that the agricultural economy was well organized and had well distributed. One of the most significant industries in their culture was the textile industry. The preservation of the ruins can be contributed to the rapid decay that took place in the 12th century BC because of the Doric invasion. The Doric invasion also ceased the building of new cities and quarters. How Mycenae came to a complete end is still a continued discussion because the acropolis shows signs of inhabitation until 468 BC, the year of destruction. The Doric invasion was not the end of Mycenae though. The first theory is population movement because the Dorian’s attacked. This hypothesis has been questioned because the Dorian’s had always been present in Greece around that time. It could have also been what the Mycenaens called the “Sea People.” The second theory is internal conflict. This is suggesting conflict between the rich and the poor because of the lower class becoming impoverished towards the end of the late Helladic period and rejecting the system in which they were governed. However when Mycenae came to an end, its demise started the Greek dark ages.